Black Ops 2 Care Package Edition Details! 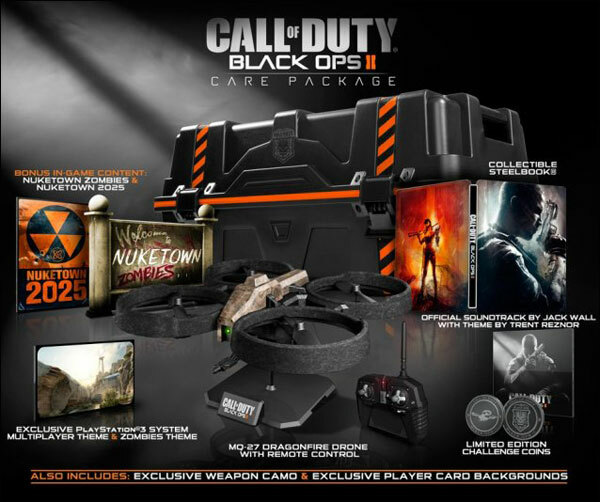 Treyarch seems to have outdone themselves this time with the special edition version of “Black Ops 2” by including a remote control Dragonfire Drone in the kit! Along with the game itself, Nuketown Zombies and Nuketown 2025 maps, as well as a bunch of other cool stuff… you get a real life MQ-27 Dragonfire Drone to fly around and scare the crap out of your dog/cat with. It’s $100 more to get the drone, so if you think the novelty will wear off in the first 3 days (like it will) then you might want to save yourself the money and just go with the hardened edition. Personally I always just grab the regular version as all these bells and whistles don’t matter to me. However, I did pre-order the game just so I could make sure I got Nuketown 2025, although if I had to bet on it, I’d say that Nuketown 2025 would be included with Call of Duty Elite right out of the box, but don’t quote me on that. You can find the full details of the Care Package Edition, Hardened Edition and Digital Delux Edition below. Remote Controlled MQ-27 Dragonfire Drone – Command cutting-edge technology, exclusively for this once-in-a-lifetime combat collection. Nuketown Zombies Bonus Map – Battle hordes of Zombies in this beloved 1960s nuclear neighborhood. Collectible 2-Sided SteelBook – Limited edition game case featuring exclusive artwork. (2) Challenge Coins – Limited edition challenge coins that serve as your key to exclusive digital content. Weapon Camo – Rank-up in style with an exclusive multiplayer weapon skin. (2) Player Card Backgrounds – Liven up any killcam with two exclusive player card backgrounds, inspired by Nuketown 2025 and Zombies. Official Call of Duty: Black Ops II Soundtrack – A digital copy of composer Jack Wall’s epic in-game score with Theme by Trent Reznor. Xbox LIVE CLAW Avatar Prop – An exclusive avatar prop, deployable to a dashboard near you. Xbox LIVE Zombies Avatar Costume – Show off your pride with an avatar costume built exclusively for fans of the Call of Duty undead. Collectible 2-Sided SteelBook® – Limited edition game case featuring exclusive artwork. Call of Duty®: World at War Game Download Token – A digital download of Treyarch’s classic title, traversing WWII storylines from the Pacific to European theaters of war. More information and assets on all of the above can be found here:http://www.callofduty.com/blackops2/ce. Thanks bruddah. Just pre ordered the care package edition.